What goes out never comes back. 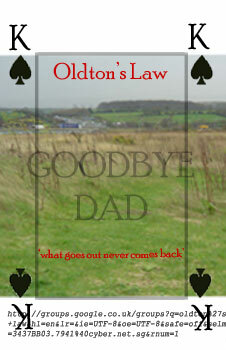 That's the first law of Oldton. It's taken me a long time to accept this. Perhaps spending all this time online has made me fall for that Brian Eno line about 'unfinished' media. In theory, sites like oldton.com are meant to keep rumbling on eternally, not only because people keep adding new contributions and new details to the map, but because each new reader remakes the site in his or her own image, by opting to deal out the cards in a different order. I just want to say good-bye and move on. I don't want to be stuck in Oldton forever. I'm making my own journey out of here. But preferably not in a little red car heading for the beach.